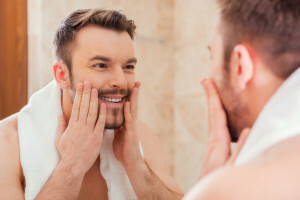 Men are often told that common signs of aging can make them look distinguished and rugged, but not everyone is ready to embrace those descriptions. BOTOX® Cosmetic, a popular non-surgical injectable treatment, can be used to subtly soften creases that might give others the impression you’re more “seasoned” than you feel. Dr. Ali Sepehr, our board certified facial plastic surgeon, utilizes his artistic eye and extensive training to customize BOTOX® injections to suit the unique needs and goals of men. Often called “Brotox,” this technique can diminish the appearance of lines and wrinkles without resulting in obvious signs of treatment. BOTOX® Cosmetic is designed to halt excess movement of the muscles used to generate expressions. By smiling, frowning, grimacing, or concentrating, your facial muscles are signaling your thoughts and feelings—and also forming wrinkles. BOTOX® injections administered into targeted areas can relax the muscles just enough to smooth the creases without sacrificing your ability to show a full range of emotion. BOTOX® Cosmetic offers a temporary reduction in these signs of aging that can last between three and six months, longer if you have regular treatments to maintain the results. Even better, effects typically kick in after about one week and downtime is rare. Have more questions? Check out our page on BOTOX® Cosmetic FAQs, or talk to one of our friendly and knowledgeable medical team members for more information.